This month, we celebrated our 20th wedding anniversary. 20! We’ve been amazed at how quickly the time has flown and yet at how much has changed since we married in 1997. It has been fun to look back at that decade of the 90’s and to compare it to where we are today. I was still in that comparison of the present day to the 1990’s mode when I traveled for business last week. I’ve been traveling for business (with some breaks around the time that we had our children) since 1994). Last week, I had a rather lengthy 3-night trip to Minnesota with a connection through O’Hare. 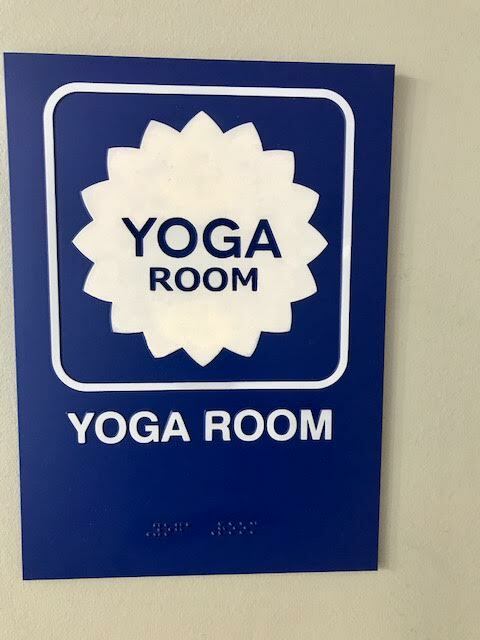 On the way home, during my 2-hour layover, I spied a sign that read “Yoga Room.” Intrigued, I followed the sign, up some stairs into a beautiful, quiet, sun-filled rotunda. There was an aeroponic garden, a mother’s room, some café tables and a nice sense of calm in this carpeted, naturally-lit space. I sat down at one of the tables and opened up the Paleo box that I had purchased at the natural foods kiosk just downstairs. While not dressed for yoga, I did check out the peaceful yoga room where someone was practicing: immaculate bamboo wood floors, floor to ceiling mirrors, yoga mats. Without the noise of overhead announcements, music, television or busy travelers rushing by, I could stop for a few moments and reflect on how far business travel has come in the 20+ years that I’ve been on the road. Specifically, I thought about how the airlines and hotels have evolved for the traveler who is trying to stay healthy during his/her trip. We are a lucky bunch. Whether we’re traveling for business or pleasure, there are so many more choices and options than ever before. And whether we’re searching for healthy food or a workout, there are more convenient choices than ever. Options in Airports: When I first started traveling, back in my 20’s, the food options in airports were extremely limited. If you were lucky, the airport you were traveling through had a Chili’s. Today, if you look hard enough, you can find healthy choices to keep you feeling nourished and refreshed throughout your trip – non-fat plain yogurt, almonds, fresh fruit, vegetable, hard-boiled eggs and salads at all the grab & go kiosks. Celebrity chef restaurants that will cater to food allergies and preferences (gluten or dairy free) – in airports! And now, yoga rooms and even gyms in airports. Check out Roam Fitness – now open at BWI – soon coming to more airports. At Roam, they will even lend you Lululemon workout gear to sweat in and Malin & Goetz toiletries for your shower after. I may just book a long layover at one of these airports! Options in Hotels: Last week, at my Courtyard in Minnesota, I was thrilled when the chef made me a special salad with no gluten, no onion, no garlic, no scallion. I follow a special diet due to a GI disorder and it makes travel and eating out difficult. But at this Courtyard, they were so helpful to make sure that I could keep my tummy in its happy place. The same chef was there to make me a breakfast that adhered to my strict guidelines too. Let me be clear – this does not happen all the time! But overall, hotels have come a long way in catering to the healthy guest in the past 20 years. I have thought for years how I would LOVE to design & develop a healthy hotel (for business travelers, at Disney World) – but it looks like someone else has thought of it. Check out Even Hotels for your next business trip. Even Hotels have a world class fitness center inside the hotel, a workout space in your hotel room (with equipment), a stand-up desk in your room, a healthy restaurant that caters to food preferences. I might check them out for a fun trip in NYC. Why not stay healthy and balanced on vacation? Grocery Delivery: This growth of grocery delivery services has changed things dramatically for the long-stay business traveler and for vacationing families. 20 years ago – I worked in management consulting and worked out-of-town Monday – Friday. I was on an assignment in NYC for a year where I had an apartment in mid-town Manhattan. It was an amazing experience that I’ll never forget – but, at the time, there were no grocery stores anywhere near my apartment. I was held hostage to the ridiculously overpriced delicatessens next to my apartment building. So, I flew from Boston to NYC every week with vegetables in my suitcase! I always wondered what the TSA agents thought while they screened the zucchini and summer squash in my bag. I also worked on a project in Chicago, flying out Mondays and coming home on Fridays. At the time they were just beginning to build a Whole Foods market across from my apartment on West Huron. But I had no grocery options. So, on Monday nights, I took a very long walk to the Potash Bros. market to buy a week’s worth of healthy food. (Uphill, both ways!) Now, you can have your groceries waiting for you when you arrive for your business or family vacation stay. Flexible Gym Options: I have a confession to make. Once, when I was working in Chicago, I pretended to be my co-worker’s wife in order to get into a gym. These were to sort of tactics we had to resort to in order to get a workout in back then! In fact, that I why I started running. I hate running – I really do. But when you are working in another city and you don’t have a permanent a gym membership there – you resort to different ways of working out. Fast forward to today – it’s a completely different story. There’s classpass, for one. Classpass allows you to take classes in many different gyms and studios in 39 different cities. And many studios allow you to take one class. In fact, when I travel now (at a rate of 1 or 2 nights about once or twice a month), I often drop into a barre or Pilates class and pay a single class rate. I’m so glad that gyms and studios have moved away from a “let’s keep people out” mentality to a “let’s welcome people in” mindset. I once had a boss who often said, “We all have choices.” And that’s the way it is with travel. I could have walked right past that yoga room sign and headed to the wine bar for my two hour layover. Now that I know it’s there I’m packing yoga gear for my next Chicago layover. Back at home over the weekend, I was still ruminating on 1997 vs. 2017 – and about the choices we make. I watched on Sunday as my 14-year-old son sat down to watch the Patriots game with my dad. He grabbed a snack from the kitchen: gluten-free pretzels and hummus. The choices my husband and I have made about a healthy lifestyle have become the choices that our children make. And that is a 20 year accomplishment that we are very proud of.